Tignes is nestled between the mountain tops in the heart of the Alps. It is a thoroughly modern and innovative resort and the residences, which are ideally situated at Tignes Val Claret, are perfectly well-integrated into the sporting life of the resort. The residences are situated in the Val Claret ski area at an altitude of 2,310 meters. They are near the funicular which can take you in just a few minutes to the Glacier de la Grande Motte. The accommodations are situated in a number of different buildings which are only between 100 and 500 meters from the shops and ski lifts. 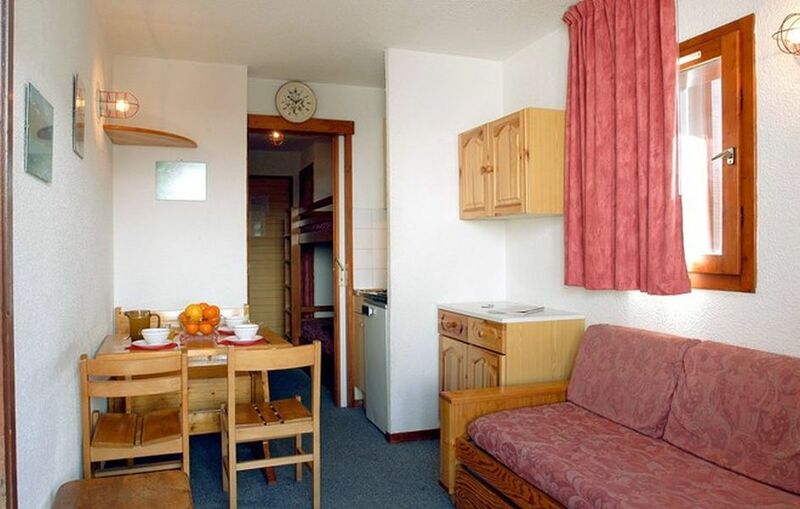 This studio is suitable for 3–4 persons and has an area of about 18 m2. In the entryway you will find 2 single beds and in the living room there are also 2 single beds. The accommodation also features a fully-equipped kitchenette with fridge, electric or vitroceramic hotplates, plus a bathroom with shower and toilet. ATTENTION: the configuration of sleeping places is only given with indicative title and may vary according to the accommodation type. A number of extra services are also available. Payment for the extra services is to be made locally. Note: The configuration of sleeping arrangements is only given as a guide and may vary according to the accommodation. Obligatory indoor or outdoor car park in winter: about 75 €/week (free during summer season).